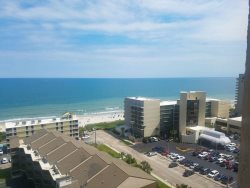 Ocean view suite at Ocean Dunes Tower I! Check out this poolside studio at the WaveRider Resort! Located right across the road from the beach, this golden-era rental is a great budget friendly accommodation! Our guests will enjoy the outdoor pools and mini lazy river at the Wave Rider. This 3rd floor studio is located very close to the stairs and elevator. This unit will comfortably accommodate 4 guests in 2 full size beds. No smoking, and no pets are allowed. This rental also features a mini kitchen with a full-size fridge, stove, sink, toaster, and microwave. This unit is fully equipped with all furnishings, bedding, towels, linens, cookware, and cooking utensils necessary for an enjoyable vacation. Cups, plates, silverware, cooking utensils, pots, pans, pot holders, coffee maker, and basic kitchen necessities are provided. For this unit we provide 8 bath towels and 8 washcloths. We also provide 3 rolls of toilet paper, 4 mini hand soaps, mini shampoo, mini conditioner, and mini lotion. We will also provide 2 towels that can be used for accidental spills and make up removal. This unit is approximately 150 yards to the Beach. The location is a short drive to golf courses, amusement parks: The Family Kingdom Amusement Park, Splashes Waterpark, Hollywood Wax Museum, Children's Museum, Famous 2nd Avenue Pier, The Boardwalk, Sky Wheel, Ripley's Aquarium, Broadway Grand Prix, Pelicans Ballpark and more. Myrtle Beach International Airport is just 2 miles away. Guest's will be able to access all pools at the Wave Rider Resort. There is a small indoor pool, but currently under construction. Complimentary WiFi is also provided!